To integrate Google AdWords with Google Analytics. 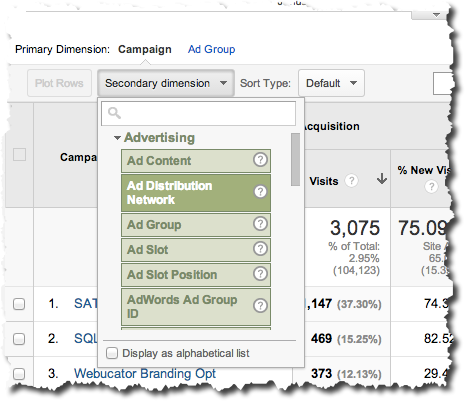 To measure AdWords campaign performance in Google Analytics. To measure paid keyword performance in Google Analytics. Which of the above metrics will you use to determine keywords profitability? Which of the above metrics will you use to understand which ads are highly visible as well as compelling enough to bring visitors to your site? Is it possible to have keywords with negative ROI? If so, how would you interpret that information? CPC, RPC, ROI, and Margin are metrics geared toward helping you understand the profitability of your keywords. You can get this information by applying subdimensions. Impressions, clicks, and CTR are the metrics geared toward helping you understand which ads receive higher visibility and are compelling enough to attract substantial amount of traffic. You have not enabled e-commerce. You have not assigned goal values to your goals. You are not linking cost data from AdWords. You are spending much more on your keywords than the money you make from the traffic these keywords bring to your Web site. Within your Google Analytics account navigate to the Acquisition report. Within the Acquisition report, select the AdWords tab. Within the AdWords tab, click Campaigns. The Day Parts report enables you to see which of your campaigns or ad groups or headlines were the most effective during what time of the day and during what day of the week. This information can be leveraged to effectively schedule ads that generate significant revenue during certain times of the day or week. In the above screen shot you can see which campaigns were most active during what time and which of these campaigns brought substantial amounts of traffic as well as revenue. Note that in the above example we are running only one campaign. However, if you have multiple active campaigns, then you will see each of those campaigns in this report. Suppose you manage a small restaurant in mid-town Manhattan. In the morning, you run multiple ads geared toward breakfast menu items and during lunch time you run multiple ads geared toward lunch menu items. You are wondering which of your ad copies (headlines) works the best at different times of the day. How would you determine this using AdWords reports in Google Analytics? Within your Google Analytics account navigate to Acquisition report. Within the AdWords tab, click the Day Parts report. 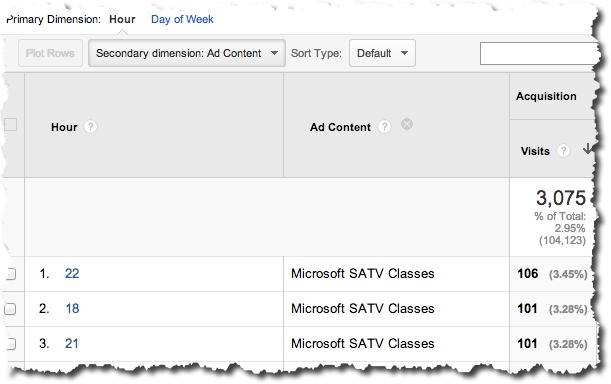 Click the secondary dimension drop-down menu and select Ad Content as your secondary dimension. In the above screen shot, notice that "Learn with Webucator" is a headline that works for us during the afternoon and the headline "Try a Webucator Course" is not that effective in bringing traffic or revenue. 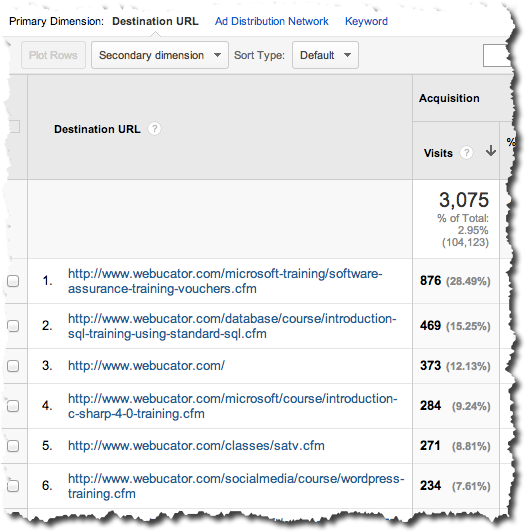 This report shows each destination URL (landing page) on your Web site that received traffic from AdWords. As shown in the following screen shot, you can analyze which of your AdWords keywords were responsible for bringing traffic to these landing pages by applying subdimensions. Where do your AdWords ads appear on Google's actual search results pages? How much influence does search position have on visits, conversions, and other site usage metrics? In the above example, you can see that the paid keyword Webucator brought most of the visits when the ad appeared in the first position in the middle of the screen. The same keyword was not that effective when the ad appeared at the first position on the right side of the screen. You would like to know the relation between a keyword, ad position, and transitions that this ad was able to generate for you. How would you identify this relation using AdWords reports in Google Analytics. 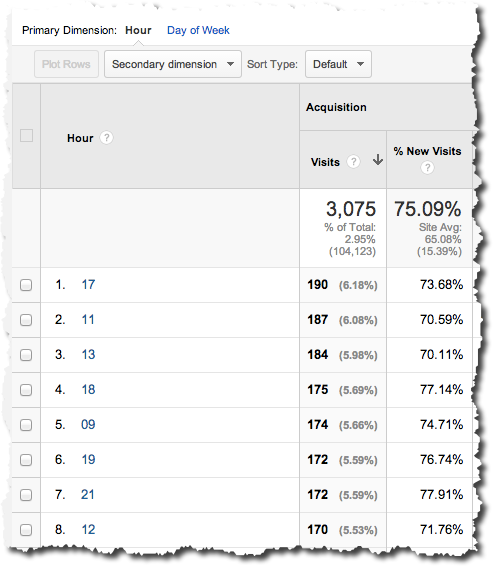 Within your Google Analytics account, navigate to the Acquisition Report. Within the AdWords tab, click the Keyword Positions report. Select a particular keyword which you would like to analyze. Click the Position breakdown drop-down box and then select Transaction. In the above screen shot, notice that the paid keyword "Webucator" was able to generate 10 transactions when the ad triggered by it got displayed at the top position in the center of the screen. 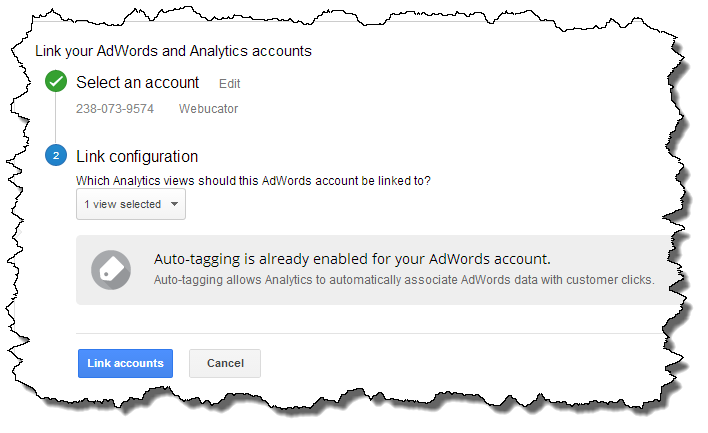 Within your AdWords account, go to the My Account -- Preferences area. Then click edit link next to Tracking. Visits Number of visits your Web site received from AdWords campaigns only. Signifies how much traffic your ads were able to generate. Impressions The number of times your search ad(s) was displayed. Clicks The number of clicks on your search ad(s) during the time period selected by you. Cost The total amount you paid to Google for clicks that you received on your AdWords ads. CTR Click-through rate shows the percentage of impressions that resulted in a click [(Clicks/Impressions)*100]. CPC Cost-per-click (CPC) is the average cost you paid for each click on your AdWords ads. RPC Revenue-per-click is the average revenue obtained from e-commerce sales and/or goal values you received for each click on one of your AdWords ads. ROI Return on investment is calculated as follows: (e-commerce revenue + Total Goal Value - Cost)/Cost. Margin Margin is calculated as follows: (e-commerce revenue + Total Goal Value - Cost)/Revenue. How visible and compelling your AdWords ads are to online searchers. How do the people referred from your AdWords Campaigns compare to the "average" visitor to your site coming from non AdWords sources. Whether your AdWords campaigns are optimized to bring high-quality traffic with high engagement.